Couples are always looking for ideas for wedding reception decor and accents. 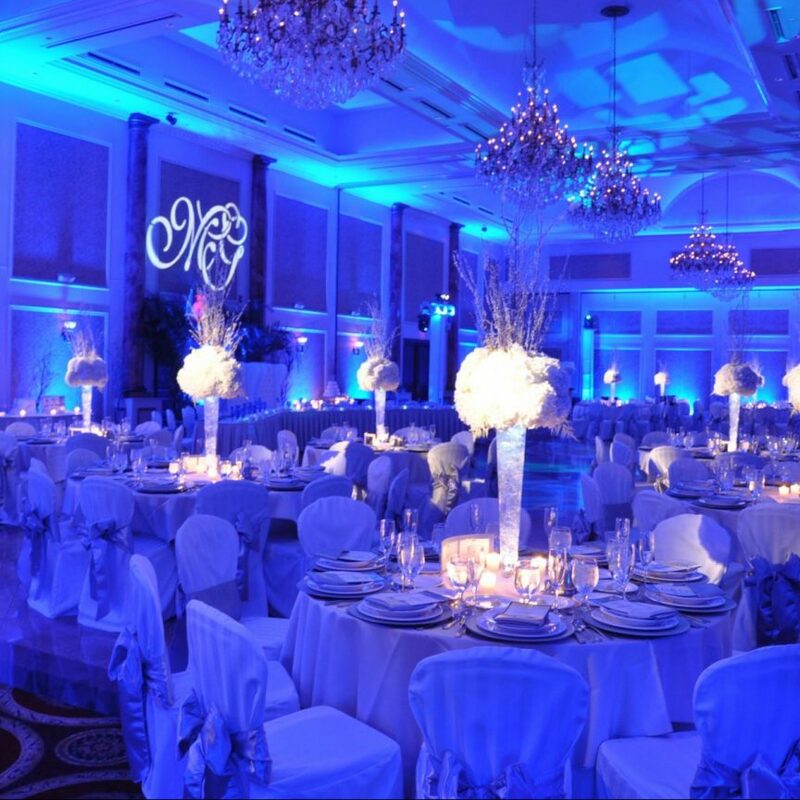 They can incorporate many unique options to transform their wedding reception ballroom to their personal preferences. From lighting décor, to draping, to a custom sweetheart table, etc…, you can customize the mood & atmosphere you envision for your wedding reception. Color wash the perimeter of your ballroom to your color theme with battery powered LED’s and accent your centerpiece color scheme. Drape the perimeter of the ballroom with white draping to give it an elegant and sophisticated feel. Accent the draping with LED up lighting to give it a warm ambiance. Another great idea is to transform your dance floor with a vinyl dance floor wrap. You can even do it with a custom logo in the center. Highlight the beauty of your centerpieces with custom pin spotting from above strategically placed around your ballroom. Up light your centerpieces to your color them from the bottom up with a translucent LED base for them to sit on. Elegantly project your names or monogram on the dance floor, wall, or draping behind the bride & groom. Add a glowing & sophisticated touch to the reception tables around the ballroom with battery powered LED’s under the tables. Be it an acrylic sweetheart table, to high back throne chairs, to a 2-seat sofa chair, etc. make a statement with a different look for the couples seating and table. Adding a flower wall behind the sweetheart table will give a unique backdrop for all the photo ops throughout the wedding reception. Tie the flower wall into your color theme. Adding lounge furniture seating/sofas, tables, and décor around the dance floor perimeter can give your ballroom a casual lounge vibe. Decorative free standing Mr & Mrs or LOVE table top letters on the sweetheart table will add a special touch to the table. Take it to the next level with larger freestanding Mr & Mrs or LOVE letters set up in front of or to the sides of the sweetheart table.